The Cairns Esplanade, or the Esplanade, is peaceful during the day with visitors catching the early morning rays and watching the unique bird life feeding along the mudflats. Palm trees line the length of the Esplanade highlighting the Tropical feel of this warm city. You will regularly see tourists getting a nice tan along the Esplanade and locals enjoying an Australia Barbeque (Barbie - check out our dictionary of Australian Slang) with family and friends whilst children play at the many playground areas within the area. The new addition to the Cairns Esplanade is the lagoon development - officially known as the Cairns Promenade. This initiative was taken by the Cairns City Council as part of its redevelopment of Cairns into a truly International destination. The Cairns Esplanade Lagoon offers a safe recreational area for the entire family. The lagoon overlooks Trinity Inlet providing a picturesque backdrop to any family outing. Be sure not to miss the Esplanade Markets every Saturday from 8:00am to 4:00pm. There are several barbeque areas available free of charge for public use. Enjoy the Australian tradition of having a "barbie" with family and friends whilst taking in the panorama views of Trinity Inlet. Please remember to be considerate of other users of the BBQ areas and remember to clean up. 7:00am to 9:00pm April to September. 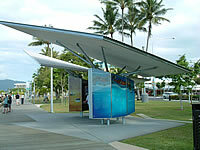 Along the Esplanade Promenade you will find three "Interpretive Nodes", or information booths, that highlight Cultural, Heritage and Environmental of the Cairns region. Located within the Information nodes you will also find access to Information Touch Screens with information regarding tours, accommodation, dining and a whole host of things to do and see whilst staying in Cairns. The Esplanade Boardwalk provides joggers, walkers and cyclists uninterrupted views of Trinity Inlet whilst maintaining their fitness. The boardwalk is approximately 800 metres long with "fitness stations" along the boardwalk for a more varied workout. The Esplanade Markets operated every Saturday between 8:00am and 4:00pm with a varied selection of souvenirs, bric-a-brac and of course food! Bird Watchers will be amazed at the diverse range of sea birds that inhabit the mudflats - make sure you bring you binoculars with you. There are posters of the types of birds and their names located at one the white shelters.